Firematic Officers 2008: Fire Chief Gregory J. Butcher; Deputy Chief Kevin M. Koch; 1st Assistant Chief Matthew Osinski; 2nd Assistant Chief Christopher Soluri; Captains Edward Krecisz and Mark Sadkowski; EMS Captain Robert Cleveland, EMS Captain (appointed) Jeremy Pullano; Day Captain Paul D. Gorman; Fire Police Captain Donald Portik; and Training Officer Captain John Wenner. Administrative Officers 2008: President Mike Braun, Vice President Jeremy Pullano, Secretary Adrian Pilliod, Treasurer Tammy Jo Gorman, Sgt.-at-Arms Dave Khreis, Financial Secretary Anthony Mastantuono, Line Secretary David W. Cole. Chief Greg Butcher reports that Grand Island firefighters and medics responded to nine emergency incidents within an eleven-hour period on Sunday, December 28th. High wind conditions contributed to this heavy workload, he noted. 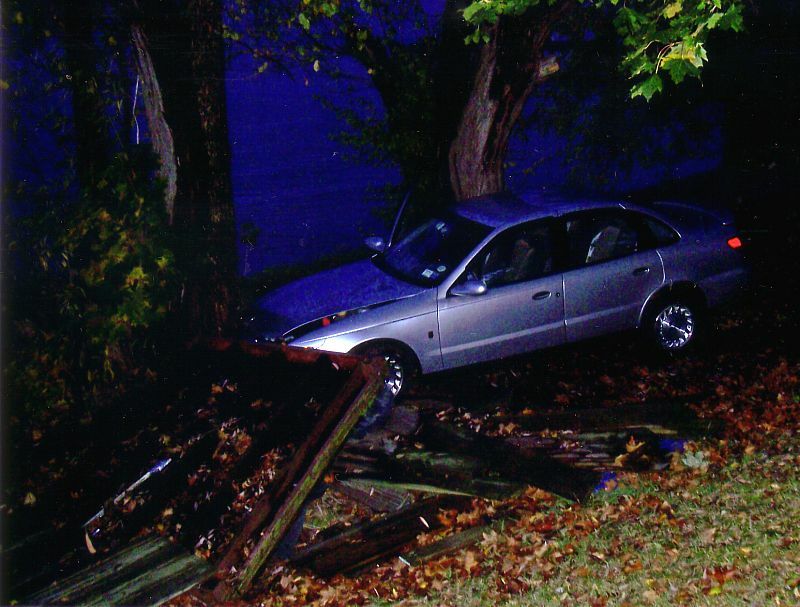 Commencing at 5:25 a.m., GIFC rescue personnel responded to a report of a vehicle striking a house at 1918 Huth Road. The driver, Benjamin Angelo, 19, of Grand Island, reportedly lost control of his auto which careened across a driveway and into the brick front home, causing a 2-foot gaping hole and considerable front end damage to his vehicle. He claimed no injuries however, after evaluation by GIFC medics. Subsequently, at 8:14 a.m., GIFC rescue personnel responded to a reported "head on" collision of two autos in front of McMahon's Restaurant on Grand Island Blvd. Charles Campanella, 43; Joan Droit, 72; and Marie Shoemaker, 78; all of Grand Island, were extricated from their heavily damaged vehicles, treated by GIFC medics for traumatic injuries, and transported to ECMC for additional medical attention. One firefighter sustained a hand injury from broken glass but was treated at the scene and remained on duty. Meanwhile, at 8:29 a.m., firefighters responded to a report of downed tree limbs on power lines in a yard at 3779 East River Road and National Grid was notified. Shortly thereafter, at 8:34 a.m., a broken tree limb was removed from Baseline Road near Countryside by responding firefighters so that traffic was not obstructed. At 8:54 a.m., an alarm of fire was received from a Grand Island School District woodworking shop at 3325 Staley Road. Investigating firefighters determined that a malfunctioning heat detector caused a recurring problem, which was reported to the alarm company for correction. At 9:02 a.m., firefighters responded to an alarm of fire at 2585 Bedell Road and found that the homeowner had "accidentally" tripped the alarm. At 11:06 a.m., an EMS call was received from a West River Road resident for a cardiac related problem, but hospitalization was not required. At 1:59 p.m., firefighters responded to a hazardous situation involving a power pole which had snapped off at its base on the Glen Avon side of the Wilson Farms store at 1787 Love Road. National Grid was notified and a safety perimeter established due to the potential life threat to passersby as well as motorists. Although a National Grid supervisor termed this as a "top priority" because of the danger involved, repair crews did not show up on scene until 10:33 p.m. when weary firefighters were finally relieved of duty. Meanwhile, at 4:58 p.m., another EMS call for assistance was handled by GIFC medics who treated a 72-year-old Town Hall Terrace resident for a cardiac related problem and arranged for transport to Niagara Falls Memorial Hospital. Grand Island Fire Chief Greg Butcher reports that firefighters responding to fire emergencies can be severely handicapped by heavy snowfalls, which recently has buried many local hydrants. He pointed out that the extra time required to locate and dig out "missing" hydrants can hamper firefighting operations and potentially turn a controllable incident into a major loss of property, or worse, a fire related fatality. Chief Butcher urges residents to clear snow away from hydrants near their property so that firefighters have ready access to a vital water supply if needed. Likewise, business owners who arrange for clearing of adjacent parking areas should take care not to isolate hydrants, thereby compromising their fire protection. GIFC fire cadets, Boy Scouts, and others have again been asked to continue their hydrant clearing efforts this winter, and your helping hands will be greatly appreciated by your "volunteers," stressed Chief Butcher. 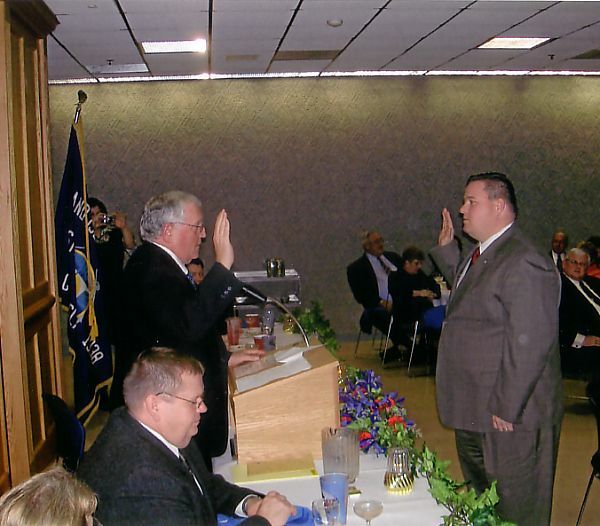 Greg Butcher will commence his seventh term as Grand Island Fire Company Chief after running unopposed in 2009 elections which were held at Fire Headquarters on December 3rd. Chief Butcher will be joined by Deputy Chief Kevin Koch, 1st Assistant Chief Matt Osinski, 2nd Assistant Chief Chris Soluri, Fire Captains Mark Sadkowski and Ed Krecisz, Day Captain Paul Gorman, Fire Police Captain Don Portik, and EMS Captains Bob Cleveland and Jeremy Pullano. President Mike Braun will be assisted by Vice President Jeremy Pullano, Recording Secretary Tony Mastantuono, Treasurer Tammy Jo Gorman. B. Reed Wright joins the Board of Review and Robert 'Butch' Meyer will hold the position of Benevolent Association Trustee. Dave Khreis was also re-elected to the position of Sgt. at Arms. Dave Tolejko and Mark Kowzan were returned to the Board of Directors for additional three-year terms. Several delegate positions were also filled. Grand Island firefighters responded to a reported "structure fire" at 2268 Center Court North, a 12-unit housing complex, shortly before 9:30 p.m. Tuesday, November 25. Fire Chief Greg Butcher reported that when GIFC Engine #3 and other apparatus arrived on scene, smoke was already spreading throughout the building and it was determine that the fire was concentrated in apt. #6. All occupants were evacuated and an interior fire suppression crew led by Capt. Ed Kresicz had the blaze under control within 20 minutes. Meanwhile, mutual aid assistance was requested and received from the Sheridan Park, Brighton, Eggertsville VFDS, and the City of Tonawanda F.D. due to equipment and manpower demands. The Red Cross also responded to assist displaced residents with emergency housing and other needs. Simon and Alice Bresnick, occupants of the affected apartment, were treated by GIFC medics for smoke inhalation and exposure. Simon was transported to Kenmore Mercy Hospital for further precautionary medical evaluation. Chief Butcher estimated total damage (fire, smoke, and some water) to the structure and contents at approximately $150,000. 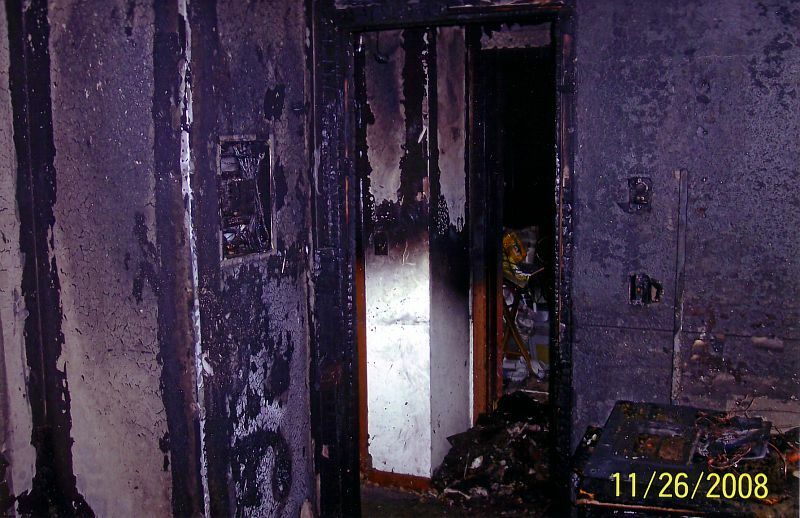 GIFC Fire Investigator Chuck Berlinger and his ECSD counterparts, Ron Kenyon, Steve Merboth, and Scott Joslin, have determined that the fire originated in a bedroom and was probably caused by a damaged electrical extension cord. Town Hall Terrace Property Manager Wayne Wolchok credited the GIFC's "quick response and fast action" with preventing more serious injuries and keeping damage limited "so that the whole building complex was not lost," as it well could have been. All participating fire units were returned to service by 11:28 p.m., following extensive overhaul and salvage efforts, according to Chief Butcher. 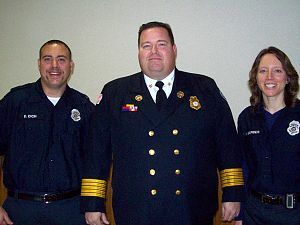 Graduates of the recent Firefighter I Training course shown with Fire Chief Greg Butcher (center) are David Cich Jr. (left) and Nicole Gerber. Not shown is David Dawson. The graduates were honored by NYS Firefighter Instructor, Rob Sanford, and Grand Island Fire Chief Greg Butcher when they received certificates of completion on November 24th at the Brighton Fire Hall. The graduate group of three will now move on to EMT training to further their career training as volunteer Grand Island Fire Company firefighters. "Congratulations to these new firefighters who have chosen to dedicate themselves to a lifetime of community service with the GIFC". 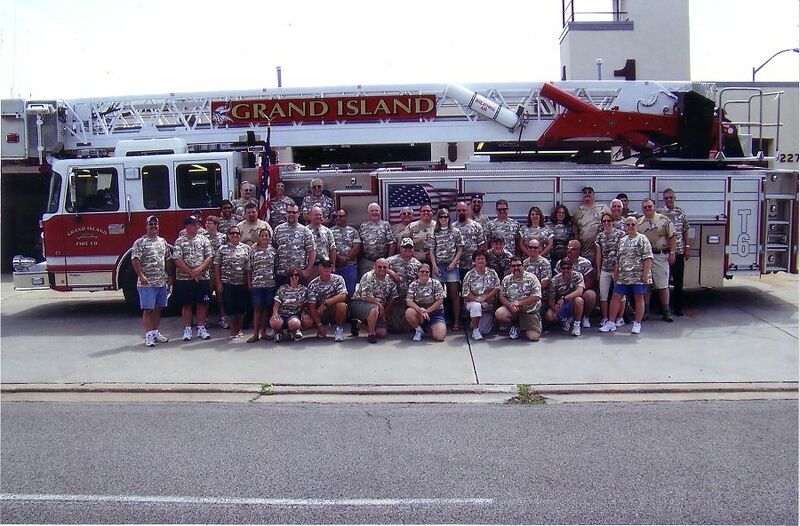 For the past several years the Grand Island Fire Company has maintained an active role in promoting firefighting and EMS training initiatives which enhance operational capabilities for both 'paid' and volunteer fire departments. 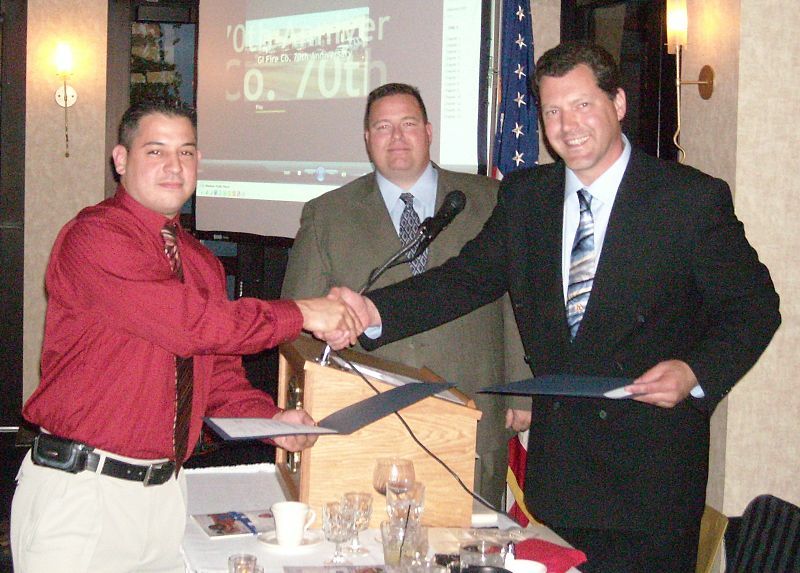 GIFC Chief Greg Butcher himself participated in a September 2008 NYSAFC leadership symposium entitled "Leadership in a 21st Century Volunteer Fire Dept." He pointed out that recruitment and retention practices must be redefined to meet the changing expectations of the contemporary volunteer. Fortunately, the GIFC leadership entity has recognized this need for generational motivation in fulfilling manpower needs which have been relatively successful to date. GIFC past chief Peter McMahon has also been well recognized for his many contributions within the fire service on both statewide and national levels. He has been actively involved in national Haz Mat conferences and is presently vice chairman of the Fire Service Section of the NFPA. His expertise as a training instructor has been incorporated into leadership courses such as "Beyond Hoses and Helmets" which is sponsored by the IAFC. 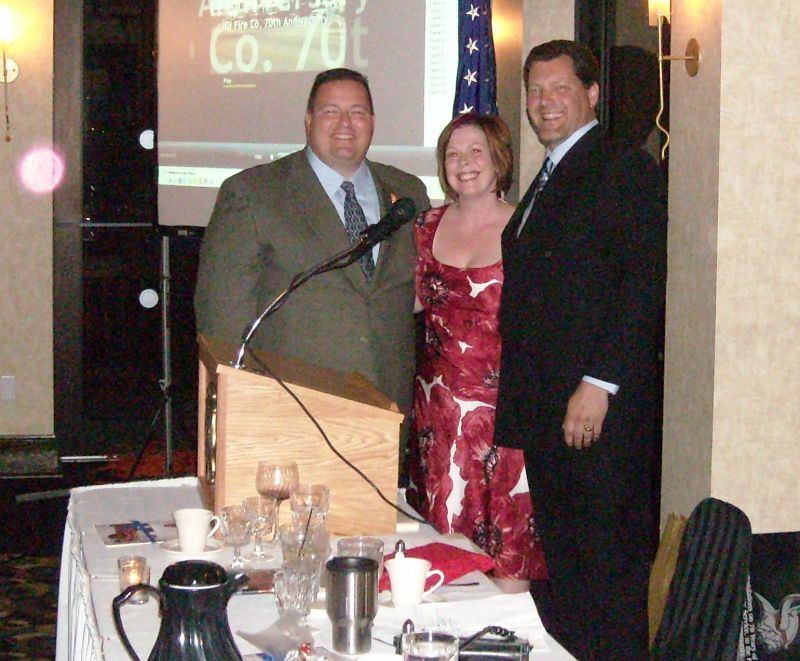 Additionally during 2008, GIFC Board Member Mike Dallessandro has carried a vital message on safe operation of fire apparatus at the FDIC in Indianapolis, Indiana and Firehouse Expo in Baltimore, MD as well as the NYS Fire District Association annual conference in Ellenville, NY. 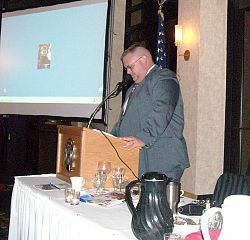 He is also scheduled for a similar presentation in Milford, Delaware and a 2009 leadership conference in Rockland County. Another high profile 'specialist' is Lt. Adrian Pilliod, who is an NFPA and NYS Fire Instructor, chairman of the NYS Association of Fire Educators, as well as an active member of the NYSAFC Public Education Committee. He is credited with implementation and coordination of the GIFC Senior Assist program, an innovative approach to those EMS patients over 55 years of age. For the first time, these 'seniors' were not allowed to "fall through the cracks," because it was recognized that after-care follow-up was required to determine whether additional resources or referrals were needed. This supportive program has been so well received that several other fire departments and agencies are seeking to adopt this GIFC model to expand their own services. Not only has the GIFC maintained a highly regarded EMT and Paramedic program, providing both BLS and ALS services to the community for over 28 years, but others in the fire service have benefited greatly from its cadre of professional trainers. The Buffalo Fire Dept. for instance, has received First Responder training since 1994 and EMT training since 2005 from GIFC training instructor Lance Kohn and his team of trainers, which include Rick Pelham, Dave Tolejko and Steve Stouter. The GIFC has also hosted many prestigious statewide training seminars such as a recent October 2008 "Street Smart Truck Company Operations, Tactics, Tips, and Tricks" workshop. Eighty-one student firefighters from as far away as Rochester, NY heard Lt. Mike Ciampo of the NYFD extol the value of adaptability under stressful conditions in order to improve skill levels and overall tactical performance on the fireground. The value of these interactive contributions may never be appreciated however, until a struggling 'senior' is helped along the way, a life is saved, or some other brave act leaves its caring imprint upon the community which we all serve, concluded GIFC Chief Greg Butcher. Grand Island Fire Company rescue personnel, shortly after 6 p.m. Monday, October 27th, responded to a one-car MVA in the vicinity of 1004 East River Rd. 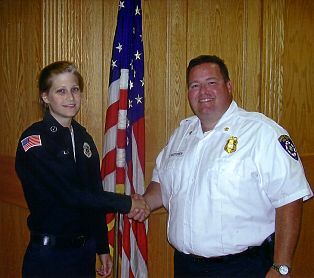 GIFC Deputy Chief Kevin Koch reported that Julia Figliotti, 17, of Grand Island had apparently lost control of her vehicle on a dangerous curve, left the roadway and travelled about 100 feet down a steep embankment, before coming to rest against a tree and dock, a few feet short of the Niagara River. she was able to safely exit her vehicle prior to the arrival of GIFC rescuers and declined hospitalization after evaluation by GIFC medics disclosed no apparent injuries. Fire and police officials agreed that the teenager was "extremly lucky" to have emerged unscathed from her harrowing experience. All GIFC units returned in service at 6:28 p.m.
Students (listed below) proudly pose in front of Engine #3 and Ladder Truck #6, next to their drivers and helpers, (left to right) Alana Brilhart, Deputy Chief Kevin Koch, Chief Greg Butcher and Capt. Don Portik. 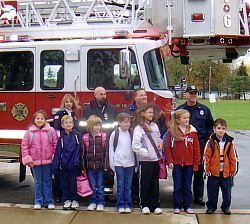 Huth Road students Jack Anthony, Brittany Kephart, Sammantha Bailey, Alexia Shivers, MaryElizabeth Rustowicz, Alyssa Jaenecke, and Alex Laschinger, winners of the 'Ride To School' Fire Prevention contest, finally got their eagerly awaited wish for a "lift" by a GIFC fire truck, when they were picked up and dropped off at school for Tuesday morning class on October 21st. Administrative officers, firefighters and guests joined GIFC Chief Greg Butcher on October 18 in dedicating a special memorial for deceased members. The memorial is located just outside the main entrance at Fire Headquarters. Chief Butcher credited Past Chief Norm Mrkall as the driving force behind this visionary project, along with committee members Gary Roesch, Dan McMahon, Dave Tolejko, Bill Wood, Bill Weis, and Allan Glessner. After an initial meeting on October 22, 2001, which followed the NYC Trade Center/Twin Towers disaster, an ongoing plan was ultimately brought to fruition during late 2007. At that time, granite stones, containing the names of 111 past members, were placed on hallowed ground in the shadow of the American flag. Chief Butcher concluded that "this memorial will serve as a constant reminder of those who gave so much of their time and effort to help build every part of the fine organization we have today." We will never forget their lifetime of sacrifice echoed those firefighters in attendance who will carry on the lofty goal of community protection. 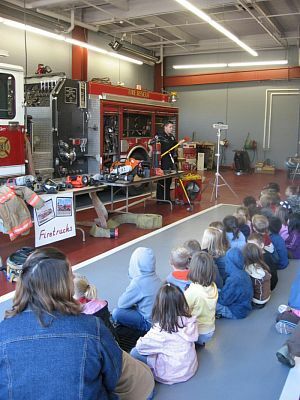 Over 3000 school students and Open House visitors received fire safety tips, hazard identification, 'hands on' firefighting experience, and equipment demos during the past week, according to GIFC Fire Chief Greg Butcher. Sidway School students again visited Fire Headquarters on Friday, October 10th, where they obtained first hand knowledge about all facets of GIFC operations, including dispatching of 911 calls for assistance, meeting firefighters in their personal protective gear, and viewing of state-of-the-art firefighting and lifesaving equipment. Chief Butcher noted that practicing 'stop, drop and roll' exercises seemed to be one of the more popular activities of the day. Subsequent Open House activities were highlighted by a momentous flag raising ceremony, using extended ladders from Eggertsville Hose Co. and GIFC Ladder Truck #6. A 'Jaws of Life' vehicle extrication demo, 'live' car fire, hose practice for kids, and equipment displays by various agencies also drew considerable attention. Program coordinator Chris Soluri is presently arranging for lucky winners of the 'ride raffle' (scroll down page for winners) to arrive at their respective schools in "big, red fire trucks," for a once in a lifetime thrill. Chief Butcher was also quite pleased to recognize several special individuals for outstanding acts of community service, which represented "the true spirit of fire prevention volunteerism" during 2008. 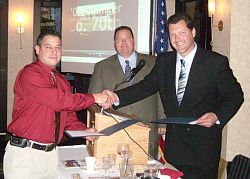 Barry and Cory Arbogast received Fire Prevention awards for rescuing two boaters whose canoe had capsized in the icy waters of the Niagara River on April 12, 2008. ECSD Deputies Warren Luick and Terry Guenot, and GIFC Firefighters Chuck Berlinger and Gary Roesch, also received special commendations for assisting in their rescue. 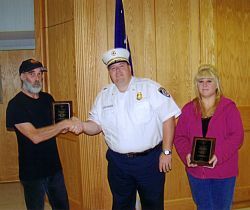 Edward Bookhagen and Deanna DeMaria also received Fire Prevention awards for their successful life saving actions in providing CPR and rescue breathing upon a 12-year-old family member on August 13, 2008. GIFC paramedic Bob Cleveland and Dispatcher Rose Amato also received commendations for their crucial, professional intervention. A heartfelt thank you to these "heroes" and the many 'volunteers' who made this year's program another tremendous success! 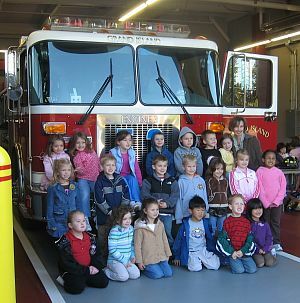 Friday, October 10 . . .The students of Sidway School took a walk on Friday, October 10th to the Grand Island Fire Company headquarters for a tour of the building and equipment. Fire Prevention Safety Week took place from October 5th - 11th across the country and students learned about fire safety, prevention and fire-escape plans. 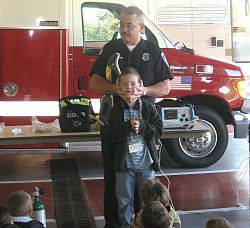 At fire headquarters, the students broke up into groups and learned about fire prevention, emergency first aid, firefighters' equipment and clothing, stop-drop-and roll demonstrations and the 9-1-1 call center from the volunteer firemen. On Friday evening, October 10th, the Fire Company hosted an open house and all attendees were entered into a raffle to ride a fire truck to school. Shortly before 2 p.m. on Sunday, October 12, 2008, a motorcycle collided with a bicycle in the vicinity of 1970 Grand Island Blvd., according to Grand Island Fire Chief Greg Butcher. The 13-year-old bicyclist of Grand Island, was unconscious and unresponsive when given ALS treatment by GIFC medics prior to his transport to Women and Children's Hospital. 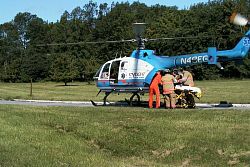 The motorcyclist, Mark Wolbert, 31, of North East, Pennsylvania, was treated for upper body injuries, stabilized, and transported to Erie County Medical Center for further attention. Subsequently, at 3:37 p.m. GIFC rescue personnel responded to a one-car MVA at 826 Whitehaven Road. Timothy F. Weczerek, 29, of Grand Island reportedly lost control of his vehicle which crossed over two lanes of traffic and a roadside ditch before flipping on its side and pinning him underneath. Chief Butcher called in a Sheridan Park VFD extrication team to assist in freeing the victim. Meanwhile, on scene efforts to revive him proved to be unsuccessful. All GIFC and mutual aid units returned in service by 6:47 p.m. after the Erie County Sheriff's Dept. accident investigators had been provided with technical assistance. Grand Island Fire Chief Greg Butcher confirms that several individuals will be recognized for "exceptional acts of community service" during the October 10th Fire Prevention Open House at Fire Headquarters, 2275 Baseline Road. 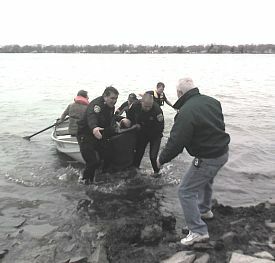 Barry and Cory Arbogast will receive 2008 Fire Prevention Awards for their quick thinking actions in rescuing Brian Mahoney and Charles Perachi from the icy waters of the Niagara River, after their canoe had capsized on April 12, 2008. Firefighters Gary Roesch and Chuck Berlinger, and Erie County Sheriff's Deputies Terry Guenot and Warren Luick will also receive commendations for assisting with the rescue. 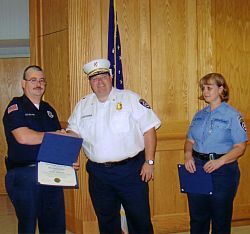 Edward Bookhagen and Deanna DeMaria will receive Fire Prevention Awards for their quick thinking actions in performing successful life saving CPR and rescue breathing upon a 12-year-old family member on August 13, 2008. GIFC Paramedic Bob Cleveland and Dispatcher Rose Amato will also receive commendations for their vital intervention. Chief Butcher stressed that the lifesaving teamwork employed in both instances represents the true spirit of volunteerism at its very best. "Congratulations to these exceptional individuals!" Grand Island Fire Chief Greg Butcher reminds all Islanders that 'Sparky' the fire dog and Pluggie' the fire hydrant are anxiously waiting to greet visitors at the October 10th Fire Prevention Open House at Grand Island Fire Headquarters, 2275 Baseline Road. This special event will take place from 5 p.m. to 8 p.m. according to Assistant Chief Chris Soluri, who has invited many agencies to contribute to the firefighting and lifesaving equipment that will be on display. "Live" fire demonstrations, "Jaws of Life" vehicle extrication, hose practice for kids, etc. will add to the thrilling atmosphere of simulated emergencies. Teams of firefighters will also conduct challenging fire safety programs at Island schools from October 6th through 10th. 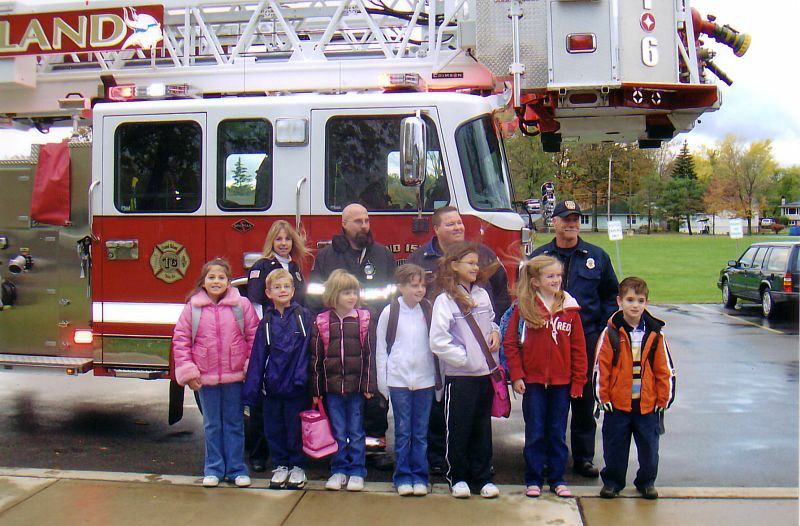 Once again, students will be able to participate in a unique drawing for a chance to ride to school in a real fire truck instead of their familiar yellow school buses. Soluri and his team will choose six winners from each of the following schools: St. Stephen, Huth Road, Kaegebein, and Sidway Elementary. He noted that this is a major highlight of the entire program, each and every year. The GIFC Ladies Auxiliary will also conduct their popular hot dog cookout, at a minimal cost, for all those who bring their appetite. Don't forget to set aside some quality time on Friday, October 10th to meet your Grand Island firefighter/medics and their many friends. Grand Island Fire Chief Greg Butcher is proud to introduce Laura Waz as the newest member of the GIFC's team of ALS providers, better known as paramedics or medics. Chief Butcher was quick to point out that Laura excelled in her academic training at Erie Community College's south campus and graduated in the top 5% of her class, prior to obtaining her NYS certification. He thanked her for "many months of personal sacrifice in achieving such a magnificent goal" and wishes her much success for the future, along with every member of the GIFC who fully appreciate her accomplishment. "Congratulations again to this exceptional individual who will contribute greatly to the current team of GIFC life saving professionals." Grand Island Fire Chief Greg Butcher announces that a special "Stroke Awareness Seminar" will be conducted by GIFC Medical Director Lee Ruotsi at 7 p.m. September 23, 2008 at Fire Headquarters, 2275 Baseline Road. EMS Capt. Bob Cleveland notes that this is one of a series of public education forums that will be offered to residents as a health and wellness advisory. Preventive measures, symptomology, treatment, and rehabilitation are especially important if you are in a high risk category for stroke or CVA (cerebrovascular accident) he stressed. He concluded, "If 95% of strokes occur in people 45 years of age or older, then this health threat deserves much more attention than it is now getting." 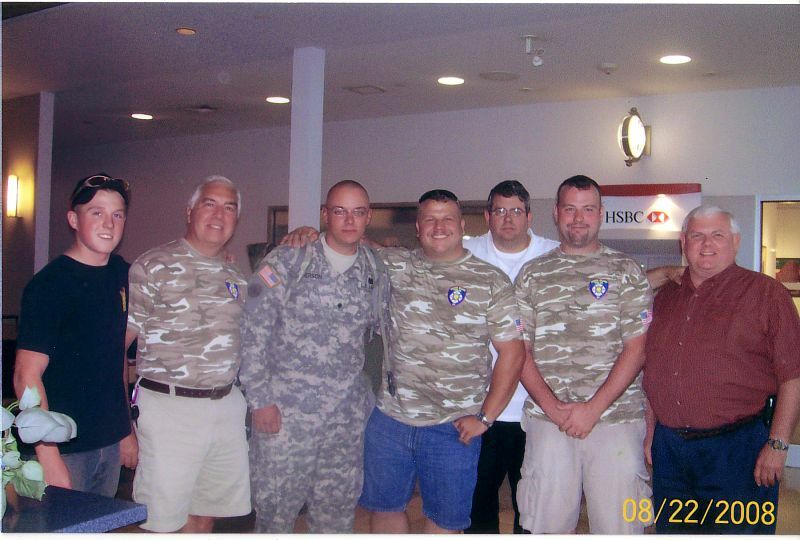 (left) Fellow Grand Island firefighters (left) Tim Krecisz, Pete Coppola, Mike Anderson, Reed Wright, Adrian Pilliod, Kerry Lanthier, and Dave Tolejko, meet Mike as he arrived at Buffalo International Airport. Mike receives a special greeting from his 11-month-old niece, Lucia, daughter of sister, Nicole, wife of firefighter, Kerry Lanthier. As a Grand Island Firefighter, Mike Anderson, has devoted many hours towards protection of life and property within his community. 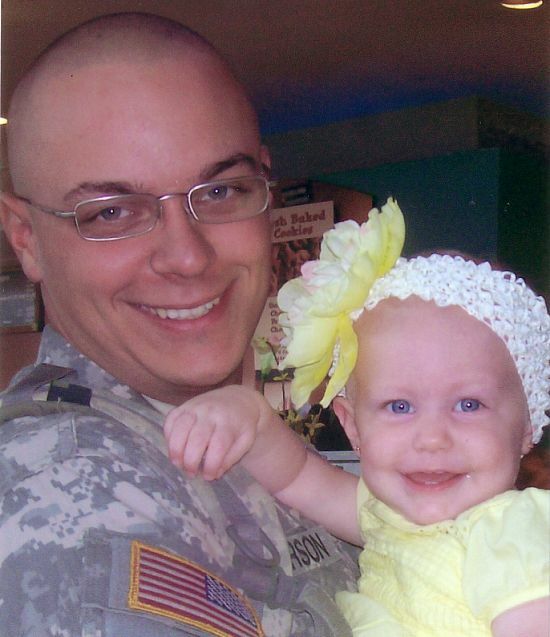 This role was suddenly expanded upon his entry into the U. S. Armed Forces and subsequent service in Afghanistan. Fortunately, a recent military leave opportunity enabled Mike to put the warfare aside for awhile and spend some precious time with family and friends. It also gave some of us a chance to say "thank you Mike for your outstanding service to community and country." 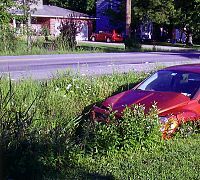 Grand Island Fire Company rescue personnel responded at 8:21 a.m. Tuesday, August 26, 2008 to a two-car MVA at the intersection of Fix and Baseline roads, according to Deputy Chief Kevin Koch. This is the second MVA occurring at that location during the past three months, he noted. Deputy Chief Koch also confirmed that both Grand Island drivers had safely exited their vehicles prior to the arrival of GIFC firefighter/medics. Josh Tanner, 24, was treated for non critical upper extremity injuries after his vehicle ended up in a roadside ditch due to the force of impact. He was transported to ECMC for further medical attention. The other driver, Kelly Remington, 38, denied injuries when she was evaluated by GIFC medics. All GIFC units returned in service at 8:47 a.m.
Grand Island Fire Company Rescue personnel responded at 11:44 p.m. Tuesday, August 19 to a report of "an attempted suicide" by a person who jumped into the Niagara River, according to Fire Chief Greg Butcher. Daniel Shedd, 25, advised firefighters that his roommate, John Camilleri Jr., 37, became distraught after an argument with a girlfriend and jumped into the water near their residence on North Colony Road. Shedd jumped in after him and they both floated down stream to the vicinity of the East River Marina where they became separated and he made his way to shore and called 911 for help. The GIFC launched two Marine Units and began a search of the area, assisted by shoreline lighting provided by Engine #3 and Rescue #1. 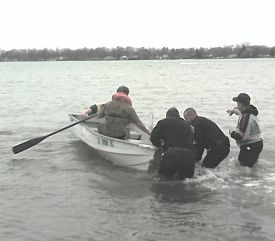 Several other agencies, including the NYSP, ECSD, U. S. Coast Guard, Sheridan Park VFD and City of Tonawanda Police Dept. assisted with prolonged search efforts, on both sides of the river. Finally, at approximately 1:45 a.m. the next morning, City of Tonawanda Police discovered Camilleri walking down a roadway near the canal (Collins Marina) and he was then transported to the ECMC for further evaluation. All GIFC search and rescue units returned in service at that time. The Erie County Sheriff's Dept. called the Grand Island Fire Company to the 700 block of Baseline Road at approximately 10 a.m. Tuesday, August 12, 2008 after they received a call of a pedestrian struck by a car. Upon arrival paramedics and other EMS personnel found a 46-year-old man lying in the road. Initial assessments found him to be unconscious but breathing. Advanced Life Support was started and Mercy Flight Air Ambulance was summoned to transport the patient to the Erie County Medical Center due to the nature of his injuries. Witnesses of the accident stated that the sanitation workers, using their vehicles' warning systems, had stopped to load roadside refuse when a pickup truck operated by an elderly Grand Island resident failed to notice the workers or the large truck stopped in front of him. After striking the worker, the pickup truck continued on and struck the larger truck. The operator of the pickup was evaluated for injuries on scene but refused care saying he was only "shaken up." Grand Island Fire Company turned the scene over to the Erie County Sheriff's Office and returned to service at 10:20 a.m.
Grand Island firefighters responded at 6:44 p.m. Tuesday, August 12th to a reported "structure fire" at the Van Dusen residence on Pleasant Trail, according to Fire Chief Greg Butcher. 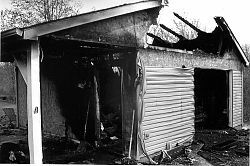 Shortly thereafter, Engines #3 and #4, Ladder Truck #6, and Rescue Truck #7-1 arrived on location and interior attack crews led by Captains Paul Gorman and Aaron Berry had the upstairs bedroom fire knocked down within eight minutes. Chief Butcher noted that quick action by firefighters confined the estimated damage of $65,000 (structure) and $30,000 (contents) to the room of origin. Fire investigators have not yet determined a specific cause. Mutual aid units from Sheridan Park VFD assisted at the scene while City of Tonawanda crews remained on standby at GIFC Fire Headquarters to handle EMS emergencies which occurred during the interim. Two household occupants, Charlene Van Dusen, 43, and her 11-year-old son, were treated by GIFC Medics for smoke inhalation after they reportedly went back into the burning building to rescue family pets. A GIFC firefighter was also treated for heat exhaustion/dehydration and relieved from duty. None of the above were hospitalized. All operational units returned in service after overhaul duties were completed at 8:29 p.m, according to Chief Butcher. Fire Chief Greg Butcher reports that Grand Island firefighters/medics responded to 162 emergency incidents, including 17 senior assist contacts, during July, which is usually one of the busiest months of the year. On a typical day such as July 27th, EMS and fire calls amounted to 11, starting at 5:26 a.m. when an assault victim was treated for his injuries at the Holiday Inn. Additional EMS calls were handled at 9:21 a.m. and 11:23 a.m. At 11:27 a.m. firefighters responded to a car fire at Grand Island Blvd. and Baseline roads. Subsequently, at 3:50, 5:26, 7:58 and 8:43 p.m. EMS assistance was again rendered for various medical problems. Shortly thereafter, at 9:53 p.m. firefighters responded to a report of "flames coming through the roof" of an an East River Road residence. An attic exhaust fan fire resulted in approximately $1000 damage. Meanwhile, at 10:26 p.m. and 11:39 p.m. firefighters responded to calls involving electrical (wires) hazards on Garden Parkway and East River Road, and National Grid was called to the scene(s). All units returned in service at 12:10 a.m. and that ended a very busy day in a very busy month, commented Chief Butcher. Grand Island Fire Chief Greg Butcher is proud to announce that Paramedic/Instructor Lance Kohn has been chosen as 2008 "EMS Educator of Excellence" by the Wyoming Erie Regional EMS Council. Lance has received this award once previously in recognition of his exceptional achievements. As a Red Cross instructor and trainer during the early 1960s, Lance helped establish an EMS program for the Grand Island Fire Company. This early "band-aid and bandage" approach soon grew into an improved MET (Medical Emergency Technician) operation which better served the needs of the community. Meanwhile, there was close collaboration with Edward 'Ted' Rayhill, M.D., who insisted that the GIFC establish a full fledged Paramedic Program. 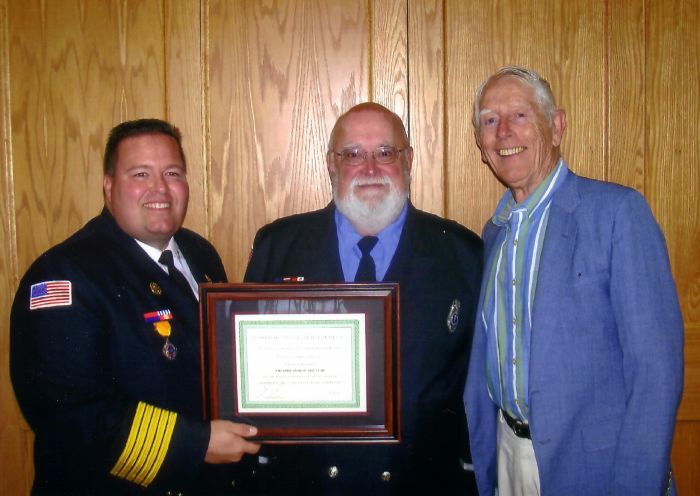 Despite those who claimed it couldn't be done, their 'magnificent obsession' came into being on October 6, 1979 and has prospered ever since as the only existing volunteer fire company paramedic program in Erie County. Although Lance is quick to point out that he is only one member of a highly skilled team of professionals, his accomplishments in the field are unparalleled. Along with life memberships in the GIFC, Fort Erie #2 F. D., Sheridan Park VFD, Empire State Rescue & First Aid Association, Town of Tonawanda F.A., ECAA, FASNY, SWVFA, WNYVFA, he has held leadership and advisory positions in the NYS Dept. of Health Division of EMS, Erie County Dept. of Health Division of EMS, and is also CME (Continuing Medical Education) advisor to the Town of Tonawanda Paramedic Unit, and CME recertification program coordinator for the GIFC. He has also made important contributions as a member of the Adjunct Faculty of the Dept. of Justice committee on chemical/biological warfare & terrorism. "Is it any wonder that Lance and his teammates have our undying gratitude for their lifetime of service and sacrifice?" a Fire Company officer said this week. These EMS 'pioneers' have made us what we are today stressed Chief Butcher who described Lance as "one of the best of the best." (left) Group photo of GIFC members who have dedicated their lives to helping friends and neighbors in need. 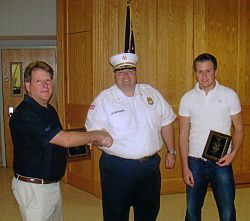 The Grand Island Fire Company thanked its life members for their long-term community service contributions during an informal get together at Fire Headquarters on Saturday, July 26. Fire Chief Greg Butcher noted that GIFC's tremendous forward progress would not have been possible without the tireless efforts by these special individuals, whose cumulative service amounts to "over 1000 years." There is no question in anyone's mind that they are an integral part of a great team that has made the GIFC one of the finest volunteer fire companies in western New York, he stressed. "Thanks again to those members who have reached that unique 20-year milestone in the fire service known as 'life membership.'" 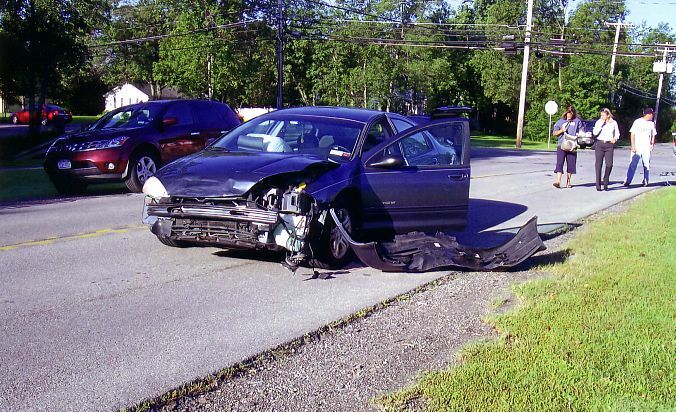 Grand Island Fire Company Rescue Personnel responded at approximately 10:25 a.m. Wednesday, July 16 to a two-car collision that occurred at the intersection of Baseline and Whitehaven roads. Fire Chief Greg Butcher confirmed that Ellen Harris-Harvey, 49, of Buffalo had to be extricated from one vehicle which had sustained severe passenger side damage. She was treated by GIFC medics for non critical, upper body injuries and transported by ambulance to the Erie County Medical Center for additional attention. The driver, Lisa Harrington, 28, of Buffalo, was treated, stabilized, and transported to Sisters of Mercy Hospital as a precautionary measure. Two Grand Island residents in the other vehicle, the 17-year-old driver and a 7-year-old passenger, were evaluated but denied injuries and were turned over to the care of a relative (mother). All GIFC units returned in service at 11:16 a.m. according to Chief Butcher. Fire Company members wore their "support our brother" t-shirts after the July 4th parade. 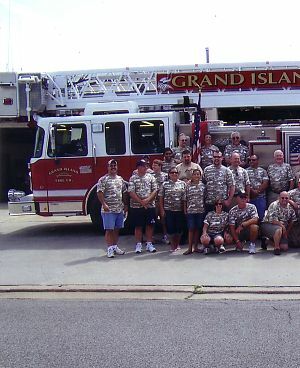 The 4th of July was not only a cause for celebration by Grand Island firefighters, but a chance to demonstrate their collective support for Mike Anderson, a member who is presently on military duty in a far away place called Afghanistan. Over 40 firefighters donned "support our brother" t-shirts after marching down the Boulevard and then lined up for a memorable photo-op in front of the new Ladder Truck #6 at Fire Headquarters. If you would like to lend your support, contact GIFC firefighter Chuck Berlinger at 870-1365 or email to cmbjr123@gmail.com. 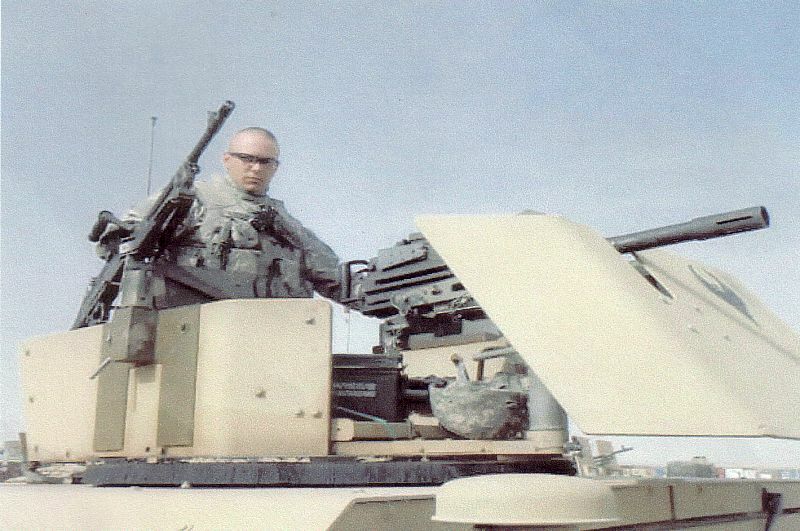 Editor's Note: Specialist Michael D. Anderson is a member of the Grand Island High School Class of 2003, serving in the United States Army National Guard. 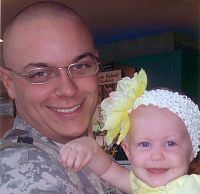 He was deployment in January of this year and will hopefully be home in January of 2009. 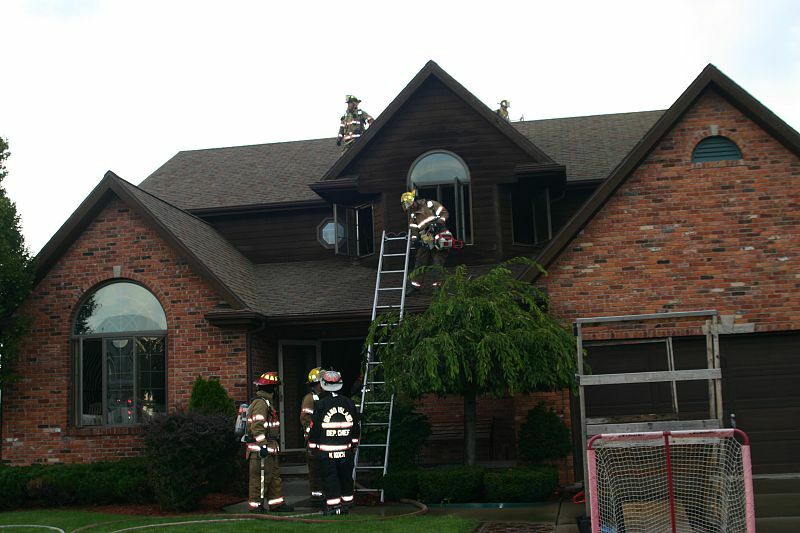 Grand Island firefighters responded shortly before 1 p.m. Tuesday, June 17, 2008 to a report of a basement fire at the River Oaks Golf Clubhouse, 201 Whitehaven Road, according to Fire Chief Greg Butcher. When Engines #3, #5, Ladder Truck #6, and Rescue Truck #7 arrived on location, light smoke was spreading throughout the structure. An immediate search of the interior determined that combustible materials had been left on a drier which led to partial ignition (smoldering) and increased generation of smoke. 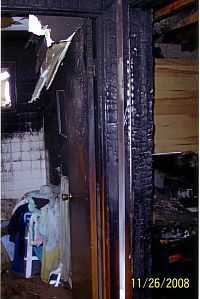 The hazard was eliminated and ventilation completed within 45 minutes. Chief Butcher reported total damage to contents at $900, with no structural involvement. All GIFC units returned in service at 1:47 p.m.
Grand Island Fire Company Rescue Personnel responded at shortly after 12 noon on Wednesday, June 18 to a motorcycle accident which occurred on the northbound I-190 near the Staley Road overpass. nbsp; Thomas Juszczak, 44, of Niagara Falls, reportedly lost control of his cycle, left the roadway, and hit the median barrier "hard," according to Fire Chief Greg Butcher. The victim was unresponsive when found by GIFC responders, who initiated ALS treatement. Meanwhile, Mercy Flight arrived on location at 12:28 p.m. and Juszczak was transported to Erie County Medical Center for more extensive medical attention. nbsp; All GIFC units returned ih service at 12:50 p.m. according to Chief Butcher. Grand Island firefighters, shortly after 11 a.m. Tuesday, June 10th, responded to a report of "smoke in the building" at the Marigold Manor Housing complex, 3026 Grand Island Blvd. Engines #3, #5, Ladder Truck #6, and Rescue #7 responded to the scene, according to GIFC Deputy Chief Kevin Koch, who confirmed that careless use of flammable materials started a stovetop fire which then spread to the surrounding area. 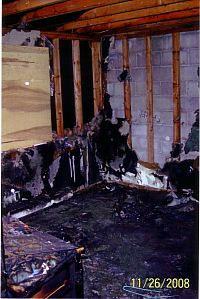 Fortunately, a building maintenance man was alerted by a fire alarm, rushed to the affected room, and was able to move the occupant to a safe place while he extinguished the blaze. Michael Golden, 53, and Rose Mondoux, 73, who is in a wheelchair patient, were both treated for smoke inhalation but declined hospitalization. Meanwhile, other residents had been moved (evacuated) to a first floor dayroom as a safety precaution. Deputy Chief Koch reported total damage at $2000 to structure and contents. All GIFC units returned in service at 11:38 a.m. after the building was ventilated and residents returned to their respective apartments. 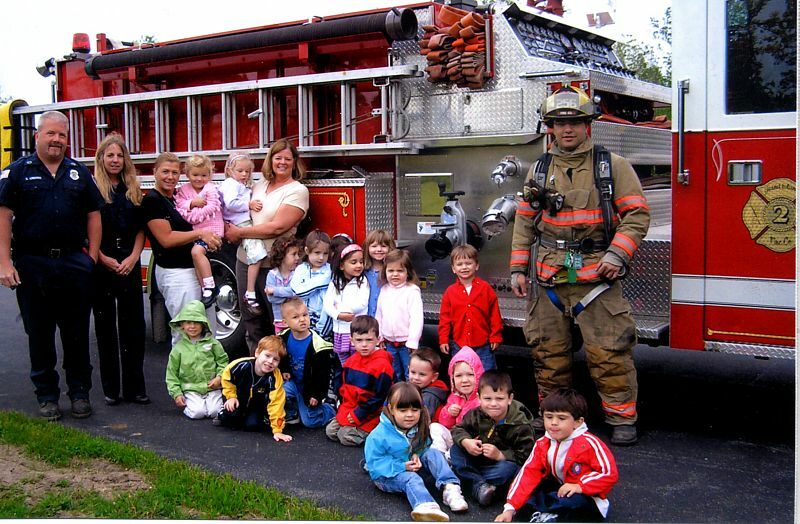 (left) Grand Island Firefighters Edward Krecisz and Lana Brilhart, Carla Casullo (a mother), Teacher Vickie Wilkinson and Firefighter Sergio Buriano pose with students of Grand Island Cooperative Nursery School - click photo for larger view. 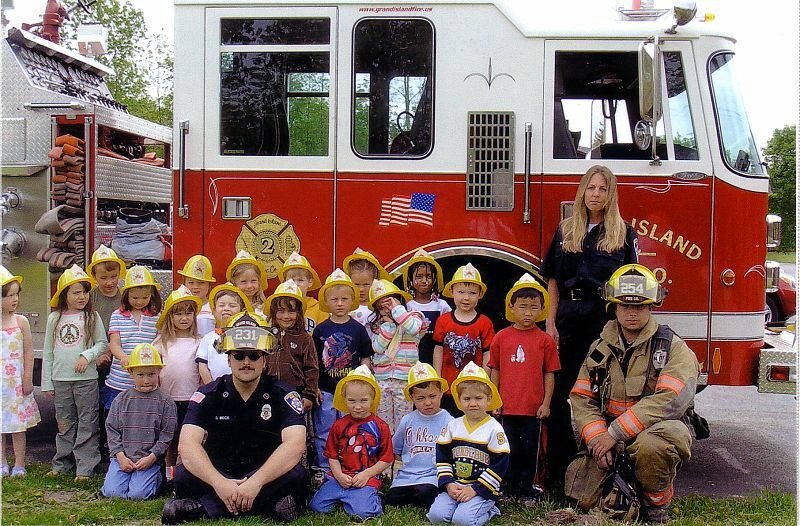 Children in fire helmets stand between firefighter Mock (left), Brilhart and Brenon next to Engine #2. - click photo for larger view. Besides 1700 plus emergency incidents per year, Grand Island firefighters spend a great deal of their "spare" time doing other things that benefit the community, according to Fire Chief Greg Butcher. If you spot a fire truck going down the road without lights and siren, it could be going for fuel, a time consuming drill, or special event. Volunteering for such special duty at a block party, sports event, community fund raiser (Relay for Life, etc. ), Fire Prevention appearance, and others, requires extra special individual effort, but in most cases is its own reward. For instance, youngsters at the Grand Island Cooperative Nursery School on Whitehaven Road had an 'awesome' experience when they recently came face to face with GIFC volunteers and their big red fire truck during a much anticipated visit. And what did firefighters Brennon, Brilhart, Buriano, Krecsz, and Mock think about the particular encounter? "Indescribably self satisfying" was one comment that pretty well summed up the feelings of all. Thanks again to our GIFC 'volunteers' for going above and beyond the call of duty! By Christopher Russell, Grand Island Fire Co.
Do you know who will race to our home on Grand Island when an unexpected medical situation puts you in peril? Were you aware that the same people who perform lifesaving emergency medical procedures are the same people who respond when an elderly citizen cannot get out of his/her chair following the evening news? Well, it's the Grand Island Fire Company's Emergency Medical Services (EMS) personnel; regardless if they are having dinner with their family or it's the middle of a cold, stormy night, these 56 active members have made a commitment to serve their community. As a way of saying "Thank you" publicly, the Fire Company held its first annual EMS Recognition Dinner on Saturday, May 26 in conjunction with National EMS Week. Besides good food, good company, and thankfully no emergency calls, 39 members listened as EMS Captain Bob Cleveland, along with keynotes speaker Dr. Edward "Ted" Rayhill, shared the history of the medical response service to the Island and shared insight towards the future. 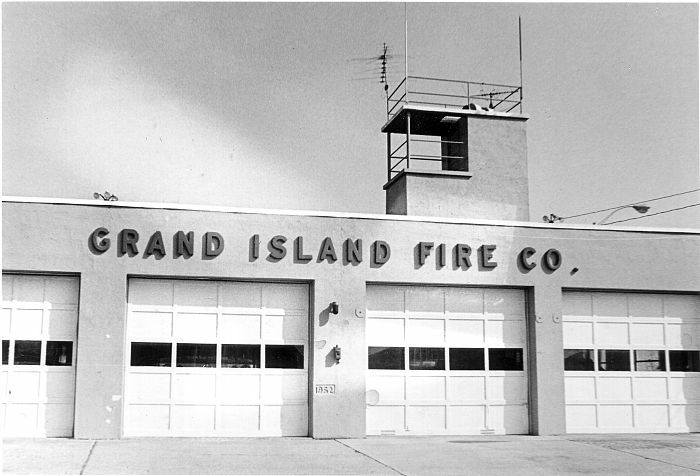 The Grand Island Fire Company, Inc. was organized in 1938 and acquired its first medical response vehicle in 1949. It wasn't until 1979 that the first Advanced Life Support (ALS) team took to the streets with Dr. Rayhill as its Medical Director. The all-volunteer paramedic crew was the first of its kind in New York State. The Fire Company still holds the distinction of being the only Western New York ALS First Response Agency which remains all volunteer 24 hours a day, seven days a week. Now with seven physicians, three primary EMS response vehicles and the "God Squad," made up of local Island clergy who respond as needed, the Fire Company looks to the future and the ever-changing needs of Grand Island. Among the items being considered are becoming an accredited EMS training center, capable of teaching EMS skills to area firemen, citizens, pursuing state and federal grants to keep the equipment state-of-the-art, and actively recruiting new members to the ranks to keep the level of response one of the finest in the State. For more information about joining the men and women of the Grand Island Fire Company, call 773-4334 or go to the Fire Company website: www.GrandIslandFire.US. As always, if you need emergency medical assistance, dial 9-1-1. Grand Island Fire Company rescue personnel responded shortly after 3:30 p.m. Thursday, May 22 to a two-car collision at the intersection of Fix and Baseline roads. One vehicle was reportedly broadsided by another which sent both of them careening into a field off the roadway due to the force of impact, according to Fire Chief Greg Butcher. Kristy Swanson, 19, of Lockport and her passenger, Jason Mathias, 19, of Pendleton, NY, were given ALS treatment for traumatic injuries and transported to Erie County Medical Center for follow-up medical attention. Kristy was transported by Mercy Flight on a priority basis. Her 1 1/2-year-old child was taken to Women and Children's Hospital as a precautionary measure although a car seat in use at the time of the accident apparently prevented serious injury. Occupants of the second car, Stephanie Ohol, 20, of Lockport, NY and Allison Englert, 21, of Grand Island, were treated at the scene for less serious injuries after crawling out of their wrecked vehicle prior to the arrival of firefighter/medics. They were transported to Kenmore Mercy Hospital for additional medical evaluation. All GIFC units returned in service at 4:23 p.m., except for a contingent of GIFC Fire Police who remained on traffic control duty while Erie County Sheriff's Dept. AIU personnel conducted their investigation. 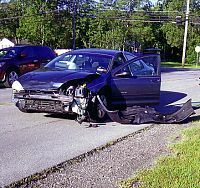 Grand Island Fire Company Rescue Personnel responded at approximately 7:30 p.m. Wednesday evening, May 21, 2008 to a two-car collision at the intersection of Grand Island Blvd. and Whitehaven Road, across from the NOCO service station. Fire Chief Greg Butcher reports that the drivers and two additional occupants were treated at the scene by GIFC Medics for non-critical injuries. Patricia Cope, 49, of Grand Island and her 11-year-old passenger were stabilized and transported to Women and Children Hospital for further medical attention. Chelsea Kearney, 19, and Sarah Sukmanowski, 17, both of Grand Island, were also treated and transported to the Erie County Medical Center and Kenmore Mercy Hospital respectively. Chief Butcher states that the roadway was reopened to traffic when all GIFC units returned in service at 8:06 p.m.
(left) Kevin Rustowicz receives prestigious life membership award. (right) Ladies Auxiliary President Kristine Koch at podium to praise GIFC firefighters as "tireless guardians of our fair town"
President Mike Braun welcomed firefighters, spouses, town officials, and special guests to share in the 70th anniversary celebration of the Grand Island Fire Company held Saturday evening, May 17, 2008 at Harry's Harbour Place Grille. Fire Chief Greg Butcher gave a 'year in review' reminder of notable accomplishments, including acquisition of a new Crimson Ladder Truck #6; recruitment, training and retention which are "at an all time high"; expansion of the GIFC Medical Director's staff to seven physicians; an outstanding fire prevention program; pending FEMA grant applications; and advanced planning for a new health and fitness center for all firefighters. Everyone takes great pride in this tremendous forward progress, he noted. Chief Butcher also received a congratulatory plaque from Assistant Chief John Buttino of Eggertsville Hose VFD for "70 years of emergency service to your community." For the second consecutive year, the GIFC also received a $500 AHIC (Agency Hans in the Community) foundation grant from Tony Mastantuono of the Allstate Insurance Co. for "outstanding" community service contributions. Firefighters received commemorative tie tacks from the GIFC Ladies Auxiliary to mark the occasion. Auxiliary President Kristine Koch expressed heartfelt gratitude to each and every firefighter "for seeing sacrifice as simple duty, and acts of heroism as only all in a days work, you allow your community to work and play and sleep in peace by being tireless guardians of our fair town. You deserve our prayers for safety and our genuine and lasting thanks." All those in attendance were also treated to a poignant slide show presentation - from humble beginnings in 1938 to 2008, by Laura Waz. She left no stone unturned in giving everyone a birds' eye view of life as a GIFC firefighter - the good, the bad, and the ugly. Board Chairman Steve Stouter concluded the formal program by commending all firefighters for their daily acts of bravery, which are almost always taken for granted as "summa quo summus," we are who we are, just doing our job. Thankfully, our volunteers will continue to be out there just doing their job for all of us. The first Grand Island Town Hall, built in 1875, became the fire hall in 1938 and was torn down in 1953. Today's modern Fire Headquarters is located in in the same place on Baseline Road between Whitehaven Road and Grand Island Blvd. The barn to the left was originally built in 1903 as a shelter for horses and wagons. 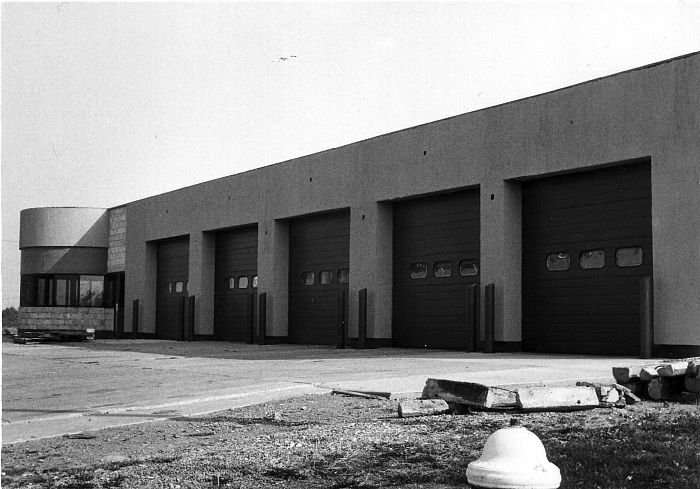 Known for years as the "new fire hall," this building was completed in 1953 and the photo showing an additional two truck bays was probably taken in the early 1960s. 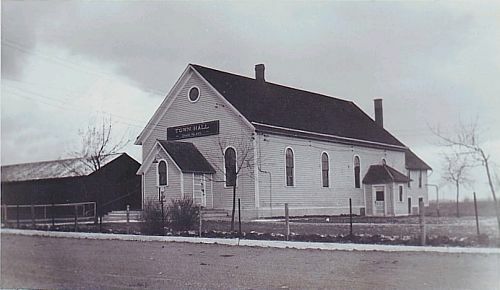 The fire hall, circa 1953, was not only enlarged but received a new, and modern facelift in 1982. Grand Island Fire Company's first fire truck, completely restored and on display inside Fire Headquarters. 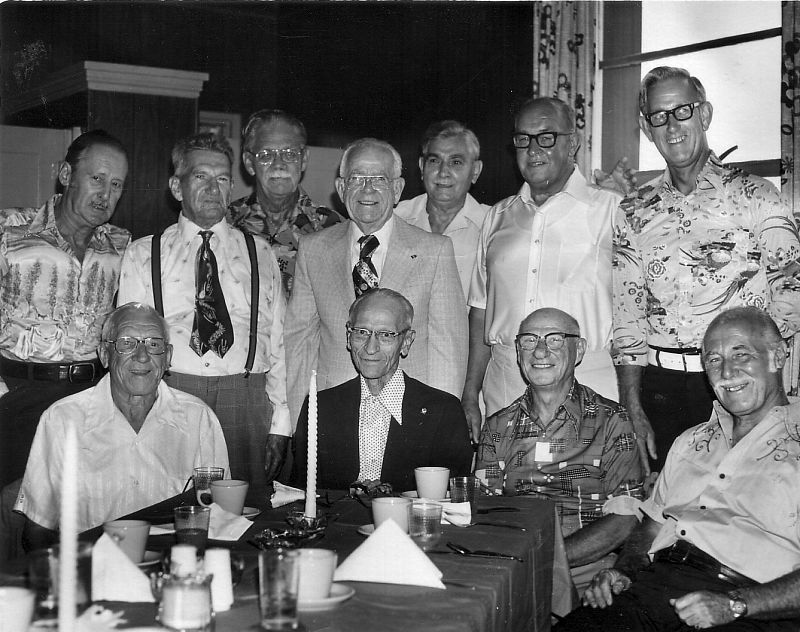 Oldest members of the Grand Island Fire Company posed for this photo at an old-timers party in the fire hall in July 1977. 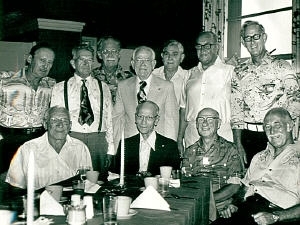 The longtime volunteer firemen, all deceased, are (front) Joe Kean, Bob Campbell, Abe Milner and Art Wade; (back) Art Mitchell, Fred Redinger, Don Hawley, Ted Klingel, Herman Reichelt, Cy Diebold and Ken Maurer. 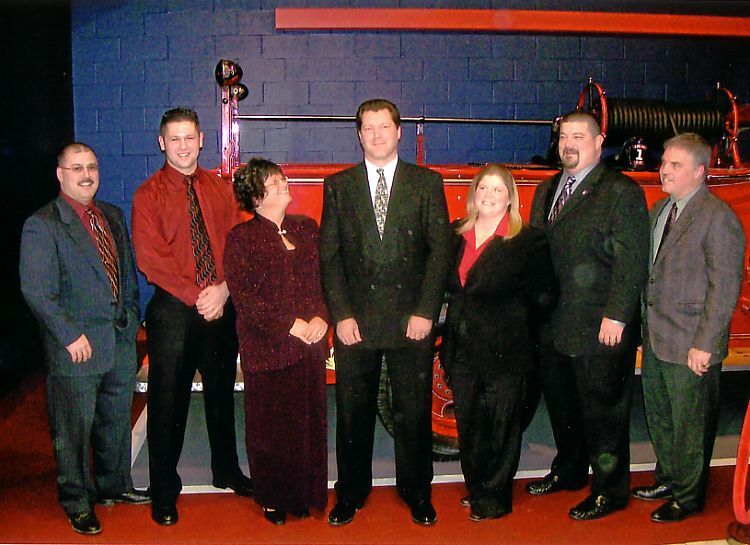 The Grand Island Fire Company turns 70 years old this month and members and guests will celebrate the occasion with a dinner dance at Harry's Harbour Place Grill. Bucket brigades! Grand Island's barn fires, house fires, hay fires, - and fires of all other kinds were fought by men with buckets and their source of water was most often the property owner's well. If it was necessary to bring men and their equipment from the mainland to fight a fire, the cost to the town was $75 per fire. And by the time the off-Island firemen and their apparatus arrived by ferry boat, it was usually to late. With the opening of the Grand Island Bridges in 1935, this help was able to arrive at the scene of a fire much faster. The need for our own fire company was apparent. Discussion of organizing a company took place at a meeting in the home of the late Supervisor John L. Mesmer on February 10, 1938. The state granted a certificate of incorporation on April 13 and the first meeting of 53 charter members was held May 18 of that year. First officers of the Grand Island Volunteer Fire Company were President Edward L. Kruse, Vice President John L. Mesmer; Recording Secretary Norman Badina; Financial Secretary Raymond Young; Treasurer Horace French; and Fire Chief Thomas Benton. The Fire Company took over the original town hall when School #9 on the site of the present town hall was turned over to the town officials. The first fire truck was delivered to the Company in July 1938. A small truck house was built on the right side of the Fire Company's hall by the men to house the truck and equipment. That fire hall was torn down when a new hall, built by the members, was completed and first opened in 1953.. Several additions have been constructed over the years. 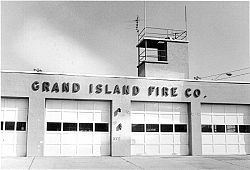 The Grand Island Fire Company has been the forerunner in the Western New York area and in the state for many innovations. 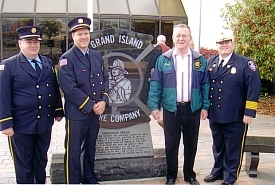 Grand Island started with a basic first aid course, eventually acquired an inhalator which saved lives, and moved on to the instruction of Emergency Medical Technicians and then the giant step, paramedic level training which began in 1978. 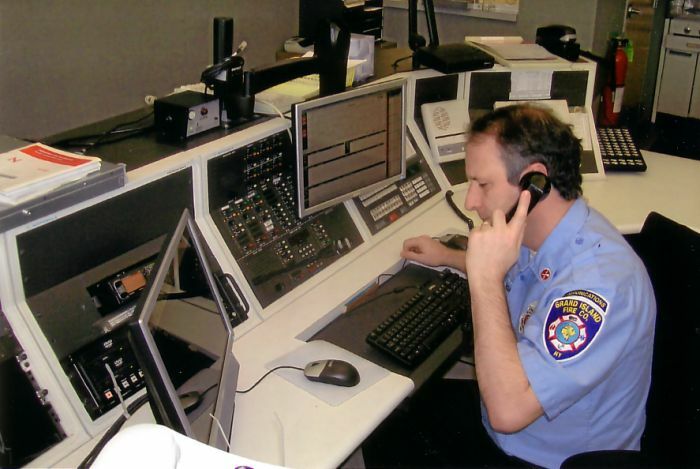 Grand Island, in 1986, began its own dispatch operation and the 911 emergency calling system became a reality for the town with company dispatchers serving as its operators. All calls to 911 are now handled 24 hours a day in the main headquarters on Baseline Road. This brief history doesn't come close to telling the story of the numerous Grand Island Fire Company heroes who have put their all into the Company. These dedicated men and women are volunteering for the community nearly every hour of every day. 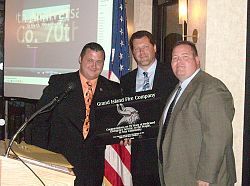 Congratulations Grand Island Fire Company and thank you. (right) Structure and vehicle show extent of fire damage as well as upward pattern of burned area. 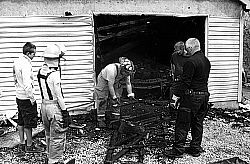 Grand Island firefighters, shortly after 12 noon on Sunday, April 27th responded to a garage fire at the John Sobieski residence on Stony Point Road. A neighbor reportedly discovered smoke venting from the structure and notified the homeowner, who in turn called 911 for emergency GIFC assistance, according to Chief Greg Butcher. The separate garage was "fully involved" when the first GIFC unit arrived on location within two minutes, and Chief Butcher noted that there was no time to remove a 1980 Camaro which was parked inside undergoing restoration. Combined fire suppression efforts by attack crews utilizing Engines #2, #3, and #5, had the fire knocked down and under control in approximately 25 minutes, although attention to "hot spots" and overhaul extended on scene operations. Chief Butcher estimated structural damage at $25,000 with an additional $15,000 to the contents. GIFC Fire Investigator Chuck Berlinger and his ECSD counterpart, Steve Merboth, noted that a considerable amount of flammables were stored in the affected building, although the exact cause of fire remains undetermined to date. All GIFC units returned in service at 2:09 p.m. according to Chief Butcher. Grand Island firefighters responded shortly before 4 p.m. Tuesday, April 15 to a reported hazardous materials exposure incident at APP Pharmaceuticals, 3159 Staley Road, according to Chief Greg Butcher. Jasen Conte, 26, of Niagara Falls was working in a lab when a regulator reportedly malfunctioned on a cylinder of hydrogen sulfide and discharged toxic fumes into the immediate area. Conte was treated at the scene by EMS personnel and transported to ECMC for additional medical attention. Meanwhile, Chief Butcher requested mutual aid assistance from the Brighton VFD Haz Mat Unit, which commenced operations under direction of their chief, Mike Galante. Two teams in encapsulated suits entered the affected building, which had already been evacuated, and capped the cylinder, while conducting precautionary atmospheric testing. The remaining toxicity was eliminated through ventilation, etc. Erie County Emergency Services Coordinator Dean Messing provided additional operational backup, while Twin City Ambulance medics handled rehab duties. A City of Tonawanda crew also remained on standby duty at GIFC headquarters until interior operations were concluded and Haz Mat teams were thoroughly decontaminated. All units returned in service at 6:36 p.m. according to Chief Butcher. The Grand Island Fire Company received an emergency 911 call shortly before 12 noon on Saturday, April 12 for "persons overboard" in the Niagara River at the 5200 block of East River Road. GIFC Assistant Chief Chris Soluri reports that members of the Barry Arbogast family were looking out their back window when they noticed a canoe suddenly capsize "about 100 yards out in the river," throwing its two occupants into frigid waters. While Mrs. Arbogast summoned help, Barry and his son, Cory, ran along the shore until they located a neighbor's rowboat, which they launched and proceeded towards the floating victims who were fortunately wearing life jackets. They reached them within "about 10 minutes" and helped lead them inland to a dock area in the 5400 block area of East River Road. They were met by GIFC firefighters Chuck Berlinger and Gary Roesch, and ECSD Deputies Warren Luick and Terry Guenot who assisted the victims out of ankle deep water and into nearby rescue vehicles. Brian Mahoney, 34, of Buffalo and Chuck Ferachi, 36, of Lockport were treated at the scene for hypothermia (20-30 min. exposure) and transported to Niagara Falls Memorial Medical Center for additional attention. GIFC Fire officials are convinced that timely intervention by the Arbogast family was instrumental in saving lives in this very serious situation. Civilian, fire and police teamwork brought this matter to a successful conclusion according to Assistant Chief Soluri. If these individuals had not been noticed when the incident actually transpired, the end results could have been quite tragic, he stressed. All GIFC units returned in service at 12:49 p.m., Soluri reported. 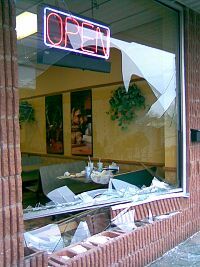 When Mike Dudley took his wife, Lisa, daughter, Kara, and son, Eric, to the local Subway Sandwich Shop on Grand Island for a quiet Thursday evening meal, he could not imagine that it would suddenly turn into an extremely harrowing experience. 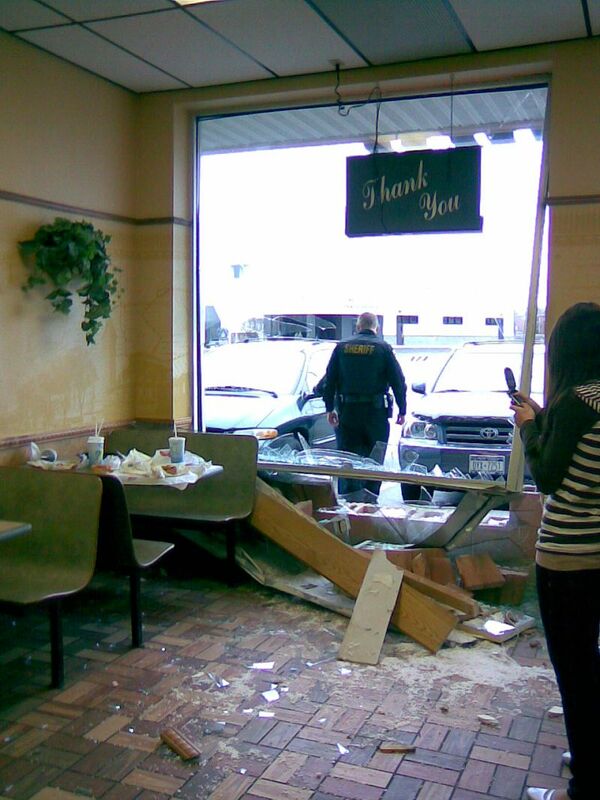 But that's exactly what happened on Thursday, April 10th when a vehicle driven by Patricia Rafferty, 44, of Grand Island, came crashing through the front plate glass window after jumping up and across a four foot walkway. Grand Island firefighters arrived on location at 6:23 p.m. according to Capt. Paul Gorman, who reported no serious injuries to Dudley family members who were sitting in the front booth where shards of glass and other debris "landed within inches." He described this entire incident as "an unexplained freak accident." The driver, who had somehow lost control of her vehicle, was evaluated at the scene by GIFC EMS personnel and transported to St. Mary's Hospital as a precautionary measure. (left) Instructor John Wenner, J. Martinez, D. Dawson, N. Gerber, R. Justin, D. Turner, M. Scappechio, R. Ayers, D. Cich, Instructor Aaron Berry. Not shown are P.Dhand, P. Peri, P. Rostam, and R. Shea. Fire Chief Greg Butcher reports that twelve new members were recently voted into the ranks of the Grand Island Fire Company, and represent one of the largest groups of "rookies" ever to be accepted. He noted that three of these recruits were elevated from Fire Cadet status where they proved their worth as future firefighters. He also noted that recruitment and retention is recognized as a paramount priority if the GIFC is to keep pace with a growing community as well as emergency incidents that reached 1700 calls for the second consecutive year. Ryan Ayers (former Cadet), David Cich Jr., David Dawson, Paul Dhand (former Cadet), Nicole Gerber, Rob Justen, Jeanette Martinez, Pat Peri, Pooya Rostami, Michael Scapecchio, Ryan Shea, and Don Turner (former Cadet) commenced their orientation during February 2008 and have entered into an intensive six-month training period, according to lead instructor John Wenner. Besides in house Cadet experience, several other "rookie" recruits have unique backgrounds which will contribute to their overall advancement. Dawson has CFR and CPR certifications, Gerber has an extensive First Aid and CPR background, Martinez is presently in EMT college training, and Shea is a former firefighter with EMT certification. "Congratulations to these aspiring firefighters and medics, who have chosen to dedicate themselves to a lifetime of community service with the GIFC. Grand Island firefighters responded shortly after 2 a.m. Saturday, March 15 to a report of "an electrical odor" on the fourth floor of the Holiday Inn, 100 Whitehaven Road. GIFC Capt. Aaron Berry reports that fourteen guests were evaluated for flu like symptoms, including headaches, nausea, fatigue/weakness, etc. He also noted that the MERS "SMART" team was called to the scene due to the number of potential victims and their ages which ranged from 4 to 17 years old for eleven of those affected. An exhaustive search of the building uncovered no fire or life threatening hazards, and those involved received medical clearance and declined hospitalization. All GIFC units, as well as SMART team medical staff, returned in service at 5:09 am. 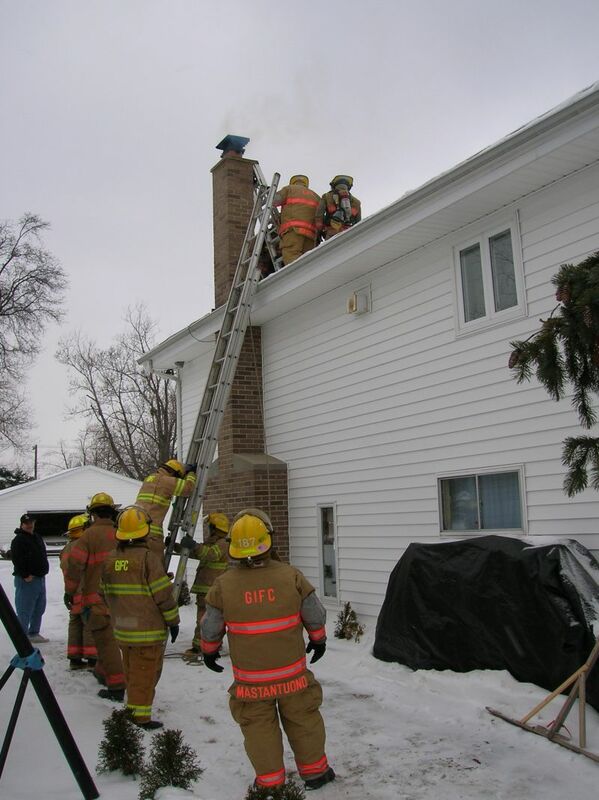 Grand Island firefighters respnded shortly before 5 p.m. Saturday, March 1st to a reported chimney fire at an East River Road residence. Heavy smoke and hot ashes were spewing forth when Engines #3, and #5 arrived on location minutes later, according to GIFC Chief Greg Butcher. 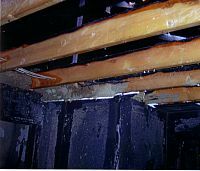 Thick creosote accumulations apparently ignited between the damper and roof line area, which limited accessibility and hampered fire suppression efforts, requiring removal of the fire box itself. Nevertheless, damage was limited to approximately $500, after extensive application of chimfex (smothering) flares, CO2 ext., and water. 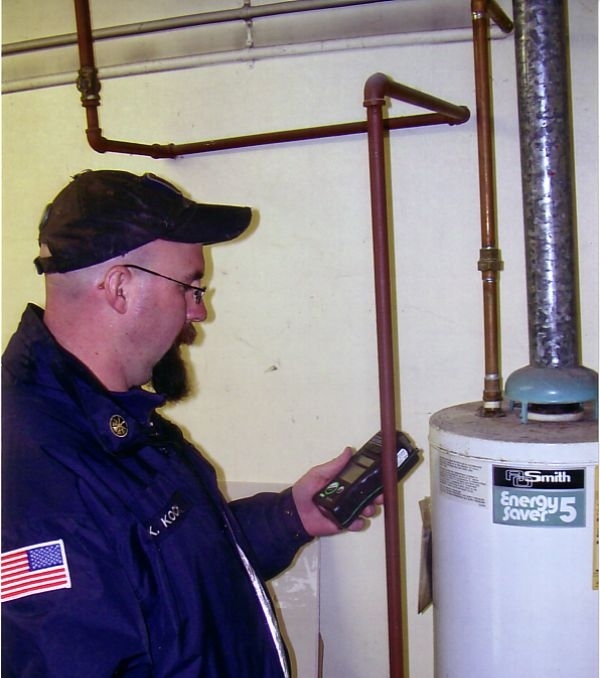 Chief Butcher reported all GIFC units returned in service at 6:35 p.m.
Kevin Koch, Deputy Chief, demonstrates use of CO detector to test for emissions from a hot water heater. NFPA (National Fire Protection Assoc.) research analyst Jennifer Flynn notes that there has been a steady increase in carbon monoxide incidents nationwide since 2005. A a result, hundreds of fatalities can be attributed to this "silent killer," which is colorless, odorless, and caused by incomplete combustion of common fuels. Fire Chief Greg Butcher reports that GIFC firefighters have handled six CO- related calls during February alone, and there is no indication of a letup in such potentially life threatening emergencies. While CO related calls for 911 assistance were received on February 11, 12, 16, 17, 27, and 28th, four of these resulted from faulty detectors and were therefore non hazardous in nature. However, the February 12th incident on East River Road involved a defective hot water heater which was later replaced after causing CO emissions of up to 77 PPM. A subsequent incident on February 17th prompted a household evacuation when a vehicle warm-up in an attached garage caused CO readings of up to 150 PPM in certain parts of the residence. Although this "silent killer" has caused no recent fatalities on Grand Island, Chief Butcher warns against complacency, and states that all inhabited buildings should have CO detectors that can provide advance warning of incomplete combustion problems from furnaces, household appliances, etc. He also notes that the increased use of power generators is another factor that contributes to dangerous buildup of CO levels where there may be inadequate ventilation. He emphasizes that preventative maintenance is an important method of lowering the risk factors. Because initial symptoms of CO poisoning (headache, nausea, dizziness, fatigue) can mimic other illnesses such as the flu, it is more critical than ever that operational CO detectors are in use, so that the exact nature of the problem can be ascertained. If there is any doubt whatsoever, the GIFC can perform further on site testing, and provide oxygen therapy if necessary, he stressed. Communications Supervisor Morgan prepares to dispatch GIFC rescue units, in response to a 911 emergency call for help. Grand Island Fire Chief Greg Butcher points out that the Grand Island Fire Company has handled its own emergency dispatching since 1985. Under ordinary circumstances, 911 calls for help will be received by training EMDs (Emergency Medical Dispatchers) who are able to initiate immediate life saving intervention in a medical emergency, or quickly dispatch firefighters to a burning structure, MVA or other rescue situation. Because unnecessary delays are all but eliminated, BLS and/or ALS treatment is substantially enhanced, and property loss by fire is significantly reduced, he stressed. However, GIFC Communications Supervisor Steve Morgan notes that the proliferation of cell phone usage has complicated the reporting of 911 emergencies, since the locality of origin does not always receive initial notification. For instance, even though a passerby might be calling (by cell phone) directly from the scene of an MVA on Grand Island, the call will most likely be received at Buffalo 911 or Niagara County 911 because of cell tower routing. Such a call must then be relayed to Grand Island Fire Dispatchers after further inquires are made, and a resultant delay is unavoidable. Chief Butcher and Comm. Super. Morgan both agree that the best way to help resolve this vexing problem is to have Island residents program their cell phones to utilized telephone number 773-7508 when seeking local emergency assistance. This will assure direct contact with GIFC dispatchers, thereby eliminating transfer delays or related complications that could jeopardize EMS or firefighting capabilities. Grand Island Fire Chief Greg Butcher established an Emergency Operations Center at fire headquarters on Wednesday, January 30th in order to cope with multiple incidents caused by storm related winds with gusts of over 60 MPH. Firefighters responded to 15 different locations between 4:30 a.m. and 9:09 a.m. to handle 911 calls for assistance involving trees and wires down, traffic signals out, and damage to homes and shoreline property. He noted that in several instances, manpower and equipment had to remain on prolonged standby to neutralize ongoing hazards. One such life threatening problem occurred at 8 a.m. when a utility pole containing transformers had snapped and toppled over on Oak Harbor Road. In addition, portable generators were also put in service to keep traffic lights working at Beaver Island Parkway and Love Road, and other locations. Town Supervisor Peter McMahon notes that there were widespread power outages in the eastern and southern areas of Grand Island, between 4 a.m. and 7 a.m. However, through the concerted efforts of National Grid repair crews, households without power dwindled to 63 by about 3 p.m. and "only a few" were still affected by Thursday morning. Supervisor McMahon also noted that shoreline damage to docks and boathouses caused by rampaging ice floes, is extremely difficult to assess at this point because high level water/ice conditions still persist. He was advised by the U. S. Corps of Engineers that this was the "second highest lake level ever" that they have had to contend with, he noted. He commended highway department employees for their non-stop efforts to clear the roadways of downed trees, etc., as well as plowing and salting to reduce travel hazards. The GIFC was highly praised for its lengthy EOC operations which extended to 2 p.m. when weather conditions became relatively stable. The supervisor thanked everyone for "a great team effort." Heavily damaged vehicle of fatally injured driver, where it came to rest in wooded area. 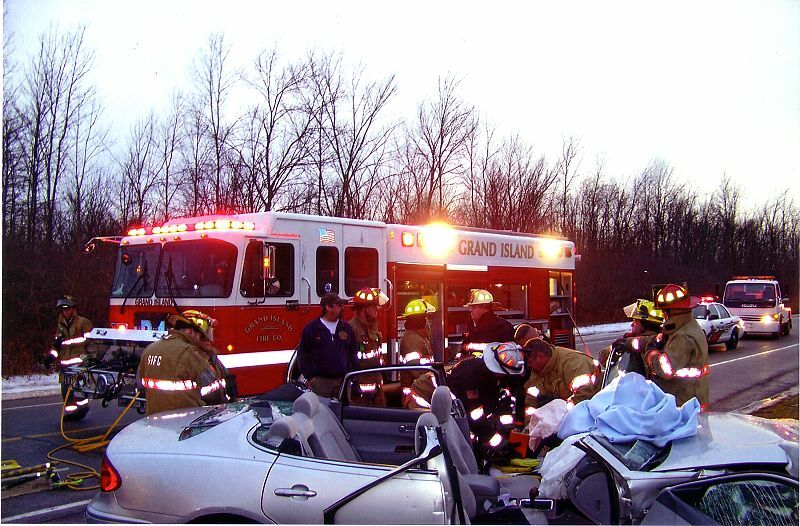 Grand Island Fire Company rescue personnel responded at 7:47 a.m. Wednesday, January 23 to a cell phone report of an MVA on East West Road in Buckhorn State Park. Two cars reportedly collided when one stopped to render aid to a motorist who had just lost control of her vehicle which left the roadway and hit a tree along a dangerous S curve. All GIFC units, except for a Fire Police contingent, returned in service at 8:38 a.m.
(left) 2007 "rookie" class proudly accepts certificates of completion - S. Shafie, J. 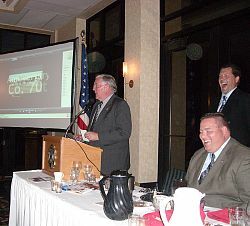 Raiser, J. Brenon, D. O'Connor, A. Brilhart, S. Buriano, and C. Russell; (right) John Brenon displays his award as head table looks on. Town Supervisor Peter McMahon administered the oath of office to newly elected Grand Island Fire Company officers Saturday evening, January 12th at Fire Headquarters on Baseline Road. 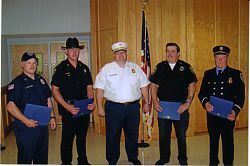 Firematic and administrative officers were sworn to uphold their community protection duties for 2008 and to meet the challenges of ever increasing emergency incidents, which are expected to exceed the 1700 reached during 2007. Greg Butcher commences his sixth year as fire chief and will be joined by Deputy Chief Kevin Koch, 1st Assistant Chief Matt Osinski, 2nd Assistant Chief Chris Soluri, Fire Captains John Wenner, Aaron Berry and Mark Sadkowski, Day Capt. Paul Gorman, Fire Police Capt. Don Portik, and EMS Captains Bob Cleveland and Jeremy Pullano. President Mike Braun will be assisted by Vice President Jeremy Pullano, Recording Secretary Laurie Berry, Line Secretary Dave Cole, Financial Secretary Pete Sukmankowski, Treasurer Tammy Gorman, and Sgt. 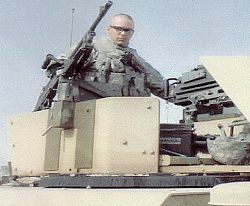 At Arms Dave Khreis. Laurie Berry joins the Board of Review, and Lou D'Orazio and Norm Mrkall will continue to hold their positions as Benevolent Association trustees. Steve Stouter was returned to another three-year term on the Board of Directors, while Don Portik was elected to his first term as a director. 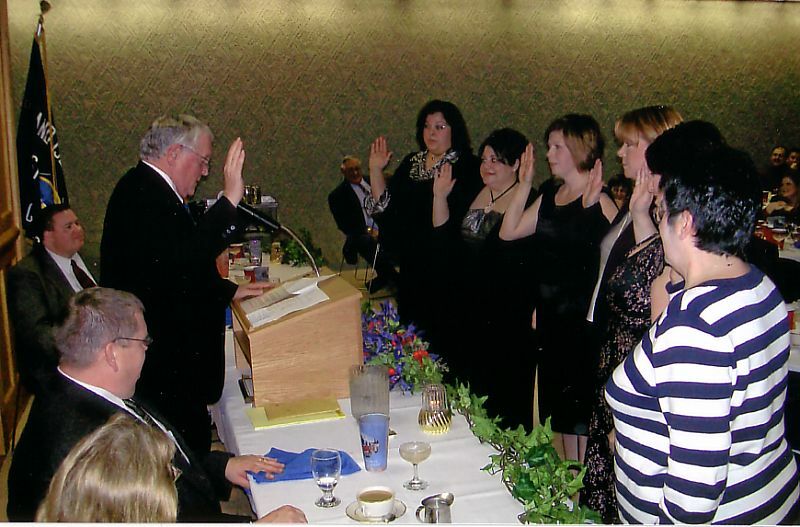 Kristine Koch, president of the GIFC Ladies Auxiliary, was also sworn in with her Vice President Jennifer Pullano, Recording Secretary Nicole Butcher, Corresponding Secretary Sandy Krecisz, Treasurer Danielle Soluri and Trustee/Chaplain Arlene Soluri. 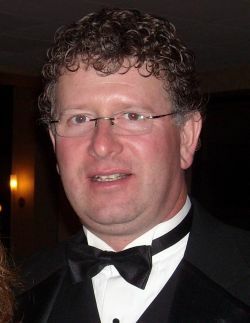 Because 2007 was one of the busiest ever in GIFC history, there were many members who made individual contributions "above and beyond the call of duty," noted Chief Butcher. Among those recognized were Pete Sukmankowski, Tom Dewey, and Adam Lock, who received special EMS commendations. In addition, Laura Waz was recognized for her year long achievements, including full time paramedic training. Mike Braun and Mike Dallessandro received special administrative commendations for their outstanding organizational efforts. For the second year in a row, Aaron Berry was cited for training excellence and leadership. 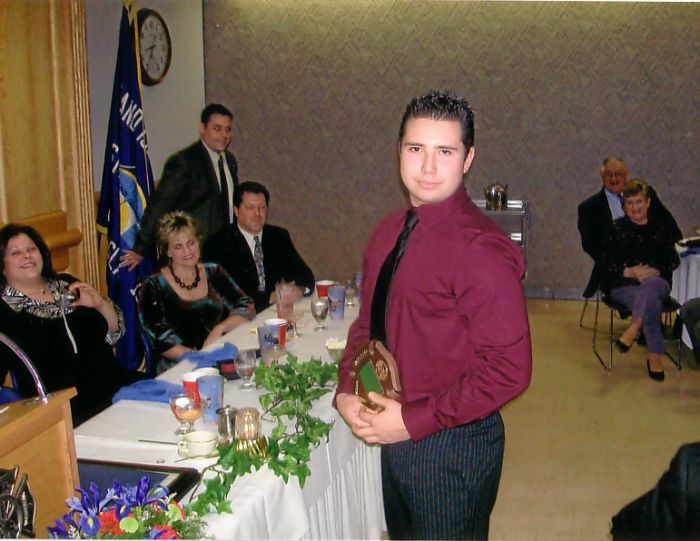 John Brenon was chosen "rookie of the year 2007" for his exceptional performance as a new recruit. 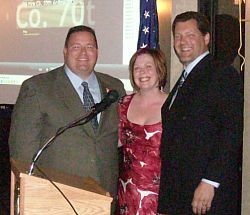 "Top Ten" responders during 2007 were led by Ray Pauley, with 709 calls. 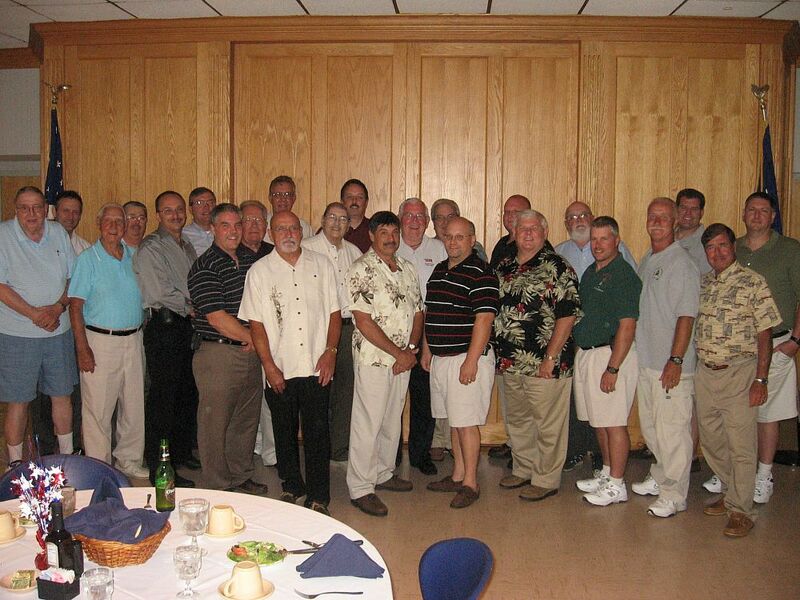 Others, in sequential order, are Pete Sukmankowski, Tom Dewey, Laurie Berry, Greg Butcher, Chris Soluri, Aaron Berry, Kevin Koch, Lou D'Orazio and John Brenon. Architect Doug Scheid was also commended for his invaluable assistance in resolving building maintenance issues. 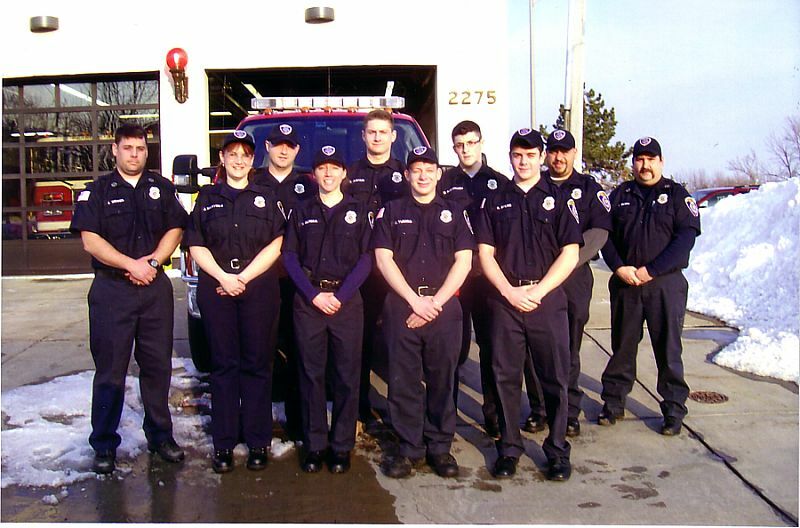 In addition, "rookie" firefighters who successfully completed their required training during 2007 are as follows: John Brenon, Allana Brilhart, Sergio Buriano, Phil Mastantuono, Pat O'Connor, Jake Olszewski, Josh Raiser, Chris Russell, Saed Shafie, and Leigh Shelton. 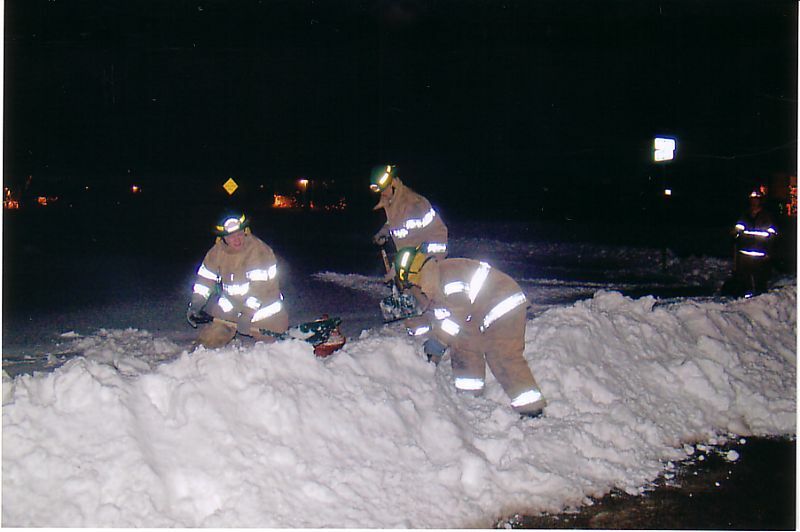 GIFC Fire Cadets prepare to 'dig out' a hydrant that was buried during a recent snow storm. Grand Island Fire Chief Greg Butcher reminds residents that they can be of invaluable assistance to firefighters by clearing snow from nearby hydrants so they are fully accessible during any fire emergency. 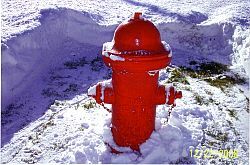 Hydrants that have disappeared under heavy snows can create time consuming delays if firefighters must first stop, locate, and then clear a buried hydrant before commencing fire suppression efforts, he noted. 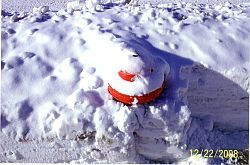 'Adopt a hydrant' programs have been highly successful in the past in removing such obstacles and giving firefighters an extra helping hand during extreme weather conditions of blowing and drifting snow. Butcher encourages everyone to pitch in and team up with their neighbors to insure that a ready water supply does not become a gamble when lives and property may be at stake.